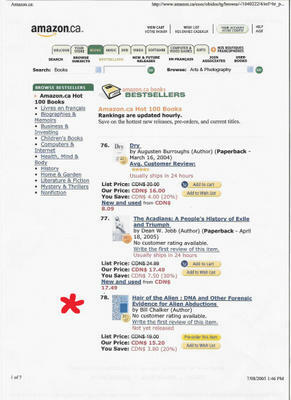 Amazon in Canada listed "Hair of the Alien" in its "Hot 100 Books" Best seller list on August 7th at a sales ranking of 78th! 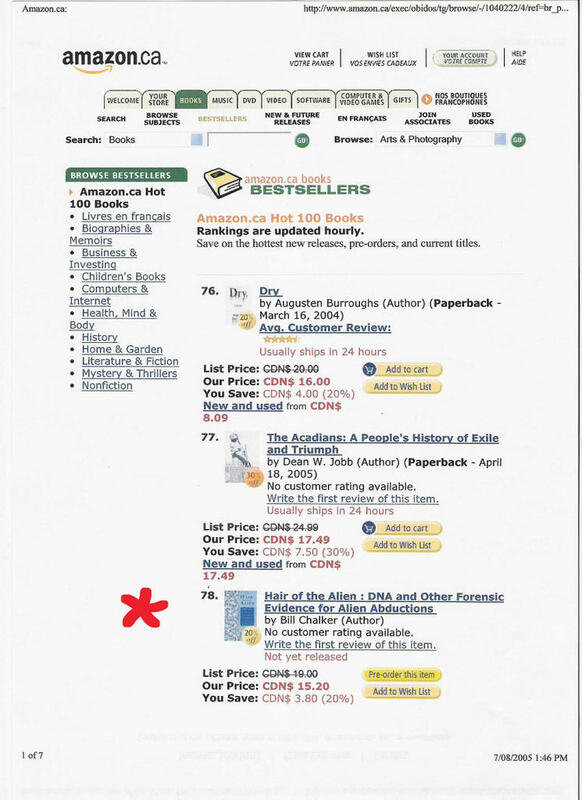 Meanwhile with Amazon in the US determining a sales ranking is like "reading tea leaves", or perhaps its like Brownian motion where the ranking bounces around all over the place. I have noticed a sales rank as low as 8,140. "Hair of the Alien" seems to rank regularly under 30,000 which seems pretty good in a book population on Amazon US of more than two million titles! Amazon US are now listing the book with a "Search inside" option revealing the front cover, table of contents, copyright page, Excerpt (the introduction) and the index. Hello! I just read Whitley's journal entry about your book and can't wait until you are on Dreamland and to get a copy of your book. Any idea when this will be? Also, would you mind if I add your blog to the link section of mine? I just wanted to say congradulations. This book will have a major impact on ufology & the way we look at future cases. INSIDE "HAIR OF THE ALIEN"
"HAIR of the ALIEN" - the book at last!